You can easily integrate FlexDoc Doclet with the Apache Ant automated build system. available to the Java VM running Javadoc. Integrating FlexDoc Doclet with the Apache Maven automated build system may be a bit more complicated because they tend to constantly change something. So, what worked some time ago, may be not working now. For instance, when preparing the last FlexDoc/Javadoc release, we have discovered that the <additionalparam> element used in Maven POM file to pass custom doclet options doesn't work and seems to have been replaced with a new <additionalOptions> element that works the same. However, that holds only for Maven working under MS Windows. Under macOS and Linux, the opposite is true: <additionalparam> does work, but <additionalOptions> is not recognized. -p:docTitle "FlexDoc/Javadoc &amp; Maven Integration Demo"
A Java API documentation generated with FlexDoc Doclet. The complete working example is included in FlexDoc/Javadoc archive prepared for downloads. 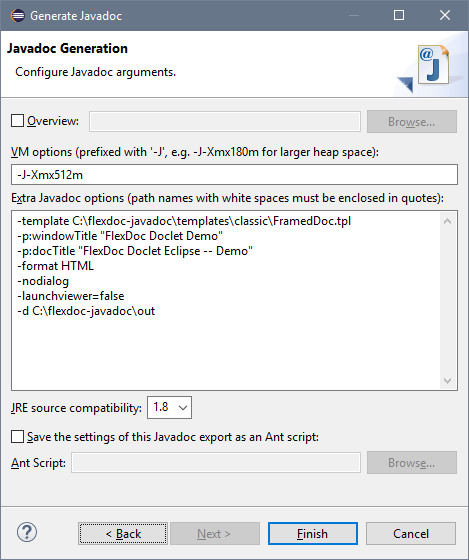 Using FlexDoc Doclet with Eclipse is most simple. You just need to fill out two dialogs. In the «Javadoc command» field, provide the location of the Javadoc executable in some JDK installed on your system. In the «Doclet class path» field, specify the full pathname of the FlexDoc Doclet Java library file: flexdoc-javadoc.jar. This file is located in the 'lib' directory of your FlexDoc/Javadoc installation. Now, you can click «Next». In the «VM options» field, you should specify the maximum memory heap size available to the JVM that will run Javadoc (512Mb may be just enough). If you leave this field empty, Javadoc (that is the FlexDoc Doclet) may slow down very much, especially on a big project, and you may get eventually java.lang.OutOfMemoryError exception! The «Extra Javadoc options» field is for the doclet-specific options. All the command-line options processed by FlexDoc Doclet that you may ever need should be specified here! In particular, with the -d option you should specify the output directory for the generated documentation. Also, unless -nodialog option is specified directly, the FlexDoc Doclet will launch the Doclet GUI over Eclipse. 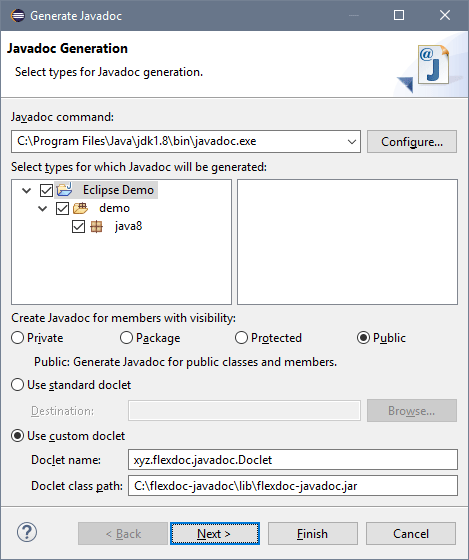 (In fact, since Javadoc is run by a different JVM, the Doclet GUI will be completely independent on Eclipse). Now, you may click «Finish» button to start Javadoc. As being a Javadoc Doclet (that is a special plug-in for Javadoc), FlexDoc Doclet can be integrated with probably anything that runs Javadoc itself. The maximum heap size used by the JVM that runs Javadoc (i.e. how to pass to it the -Xmx option). Once you know those things, you will be able to run FlexDoc Doclet within your tool!